There’s always something to be discovered in Khmer art. Just ask renowned Angkor scholar Vittorio Roveda. 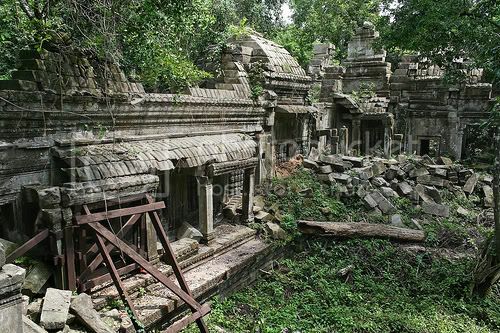 In a recent Siam Society lecture, Roveda questioned the accepted Hindu attribution of the Angkor temples of Banteay Samre, Chau Say Tevoda, Thomannon and Beng Mealea and presented evidence of underlying Buddhist iconography. Roveda is particularly interested in Khmer history covering the 12th and 13th centuries, a period characterised by dynastic rivalries. The era also marks the Khmer Empire’s transition from Hinduism to Mahayana Buddhism in the 1300s, and then back to Hinduism before the eventual rise of Theravada Buddhism in the 1400s. A systematic defacing of Buddha images occurred in this period, especially after the reign of Jayavarman VII, who was in power from 1181 to sometime after 1206, he says, pointing to the various Buddhist elements in Angkor temples that were subsequently replaced by Hindu-inspired sculpture. According to Roveda, defacing religious images was motivated more by politics than religion, and as the throne changed hands from one dynasty to the next, iconoclasm became a major political tool, one that was used until the reign of Jayavarman VIII (1243-1295). Interestingly enough, this story has some parallels to the story of the pharaoh Akhenaten, of Egypt’s New Kingdom who reigned about 2,000 years before. During his short reign, he managed to change the polytheistic state religion into a monotheistic one, directing worship towards Aten, the sun god. The people didn’t seem to take too kindly to the drastic change of gods: after his reign, it seems there was a violent upheaval against his religious reforms and Egypt returned to the polytheistic religion it was used to. Poor Akhenaten’s sculptures were defaced and his named was erased from the official king-lists. Unlike Akhenaten however, Buddhism eventually regained its position as the dominant religion in Angkor (albeit the Theravada strain rather than the Mahayana version), and Jayavarman VII is still considered one of the greatest kings from Angkor. You can read more about Jayavarman VII’s efforts to establish Buddhism as the state religion in Angkor in Defying Dynasties – as well as a quick tip on distinguishing the Buddhist temples from the Hindu ones! Find more books about Angkor in the SEAArch Bookstore. Do you happen to know any links to Vittorio Roveda’s personal website / blog? Sorry, I don’t have that information. Sorry I can’t help.